• Positions 1 through 6 will be required to match the Contracting Office ID (AAC). 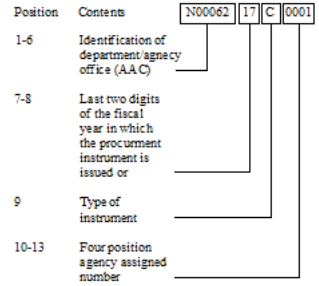 • Positions 7 through 8 will be required to match the Fiscal Year of the Date Signed. • Position 9 will designate the type of instrument. • Positions 10 through 17 will be assigned by the Agency. Each Department can decide the length of their PIID. However, the entire Department must comply with that length. The minimum length is 13 characters and the maximum length is 17 characters. New validation rules for the Uniform PIID Structure become effective on the deployment date. The new rules will be enforced beginning on 10/1/2017, for all newly created Base CARs and newly created Change PIID Modifications, based on Date Signed. Existing Base CARs signed on or after 10/1/2017 will not be validated on ‘Correct’ if they were approved prior to the deployment date. The new validation rules to enforce this structure are available in the spreadsheet (click link below). Implement the Uniform PIID Structure for Modifications for Civilian Agencies. The new Uniform PIID Structure requirement for a Modification is to have the Modification Number start with either the letter A or P and have a length of 6 characters. The letter A shall be used for modifications issued by the contract administration office (if other than the procuring contracting office). The letter P shall be designated for modifications issued by the procuring contracting office. The Modification Number must be 6 characters. New validation rules will be enforced on Modifications to Base CARs that have a Date Signed on or later than 10/1/2017. If the Base CAR was signed prior to 10/1/2017, the new validation rules will not apply to Modifications. The Modification rules are the last four in the above spreadsheet.